Automatic Emergency Braking Market size was valued at over USD 6.5 billion in 2017 and is estimated to exhibit 14.5% CAGR from 2018 to 2024. As per National Highway Traffic Safety Administration (NHTSA), in 2015, in the U.S. over 129,000 pedestrians were involved in crash-related injuries. Countries are taking initiatives to increase awareness regarding crash car safety thereby driving the automatic emergency braking (AEB) market size. For instance, in 2018, Institute of Road Traffic Education launched ‘Stop the Crash’ campaign to showcase benefits of advanced vehicle systems such as electronic stability control and autonomous emergency braking. Rising passenger car sales will contribute significantly towards industry expansion over the forecast period. Major automobile manufacturers are equipping crash avoidance technology in medium and luxury car segments. For instance, in 2017, Toyota equipped AEB system in over 50% of its vehicle fleet. Moreover, electric & hybrid car manufacturers including Tesla are providing crash avoidance technology as standard in majority of vehicles, thereby influencing automatic emergency braking market share from 2018 to 2024. Proliferating autonomous vehicles demand coupled with growing concerns for driver and passenger safety will boost the market size. Vehicle owners are transitioning toward advanced features such as adaptive cruise control, lane departure warning, forward collision warning with automatic emergency braking, and blind spot detection system. Lack of supporting infrastructure along with higher costs associated with the incorporation and maintenance of these systems may restrict the automatic emergency braking market size over the forecast timeframe. In addition, absence of appropriate frequency band for operating such electronic systems may hamper the system performance. However, governments are implementing new policies for offering low frequency brands to be used for automotive purposes. For instance, in September 2015, Government of India de-licensed some low frequency bands for usage in the automotive industry, providing a positive outlook for the industry expansion. The disk brake segment accounted for over 65% volume share in 2017, owing to increasing AEB installation in commercial and passenger vehicles. Additionally, government organizations such as the NHTSA are reducing the minimum braking distance requirements, that positively influences the product demand. 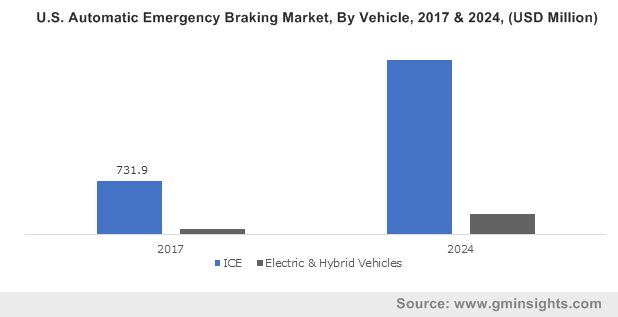 Advantages associated with system including prolonged durability, lower noise & warping, along with superior thermal conductivity will further propel the automatic emergency braking (AEB) market growth till 2024. Drum brakes will witness significant gains at over 17% from 2018 to 2024. Lower component cost along with minimum maintenance requirements are boosting the segment share over the forecast timeframe. Further, increasing applicability of these brakes across multiple budget hatchbacks will further support the automatic emergency braking market expansion over the study timeframe. ICE vehicles will witness growth at 17% owing to benefits offered such as improved vehicle efficiency along with reliable operation over a longer duration. Increasing construction and commercial activities across the globe will drive the HCV automatic emergency braking market size. Industry participants are continuously investing in R&D for introducing technologically advanced HCVs, supporting the industry proliferation till 2024. For instance, in 2017, Tesla introduced the Semi Truck with advanced autonomous driving and braking technologies, supporting the industry proliferation over the projected timeframe. Hybrid & electric vehicle segment accounted for around USD 300 million in 2017. Regulations associated with the sales of such vehicles is supporting the segment growth till 2024. Lower noise, superior power and torque output are the major benefits offered. For instance, The Norway Government offers a wide range of incentives for selling electric vehicles across the country including exemption from 25% VAT on leasing and purchase, free municipal parking, and access of HOV and bus lanes, positively influencing the automatic emergency braking market expansion over the projected timeframe. The crash imminent braking segment will pose a CAGR at 16.5% over the forecast period. Increasing usage of crash imminent braking systems to avoid rear-end-collision will propel the automatic emergency braking market growth till 2024. The incorporation of forward-looking sensors along with forward collision warning system alerts will support the industry proliferation over the projected timeframe. Dynamic brake segment accounted for a revenue share of over 20% in 2017. The increasing adoption of these systems in the event of a potential collision is supporting the automatic emergency braking market proliferation over the study timeframe. Further, the reduced wear and tear to the tires and brake pads owing to uniform brake application, further accelerates the industry expansion over the forecast timeframe. Forwards collision warning systems will account for a considerable share over the forecast timeframe. The increasing incorporation of the technology by major automobile manufacturers across their product portfolio is boosting the industry share over the forecast timeframe. For instance, in 2018, Dodge introduced its forward collision warning system based on radar and camera technology for providing audio and visual alerts along with brake application in the event of potential accidents, positively influencing the automatic emergency braking market share till 2024. Presence of major industry players including BMW, Volkswagen, Mercedes, Volvo offering innovative AEB solutions in their product line-up will boost the market growth in Europe. Vehicle safety regulating organizations including Euro NCAP are promoting the development and mandatory deployment of AEB systems in vehicles to safeguard occupants and non-occupants, providing a positive outlook for the industry expansion. North America holds significant share owing to increasing stringent regulations for vehicle safety. Automakers are equipping their previous vehicle models having appropriate hardware with collision avoidance systems. For instance, in 2015, Tesla upgraded the previously launched Model S with semi-autonomous driving systems. Such initiatives will further accelerate the automatic emergency braking market growth over the forecast timeframe. 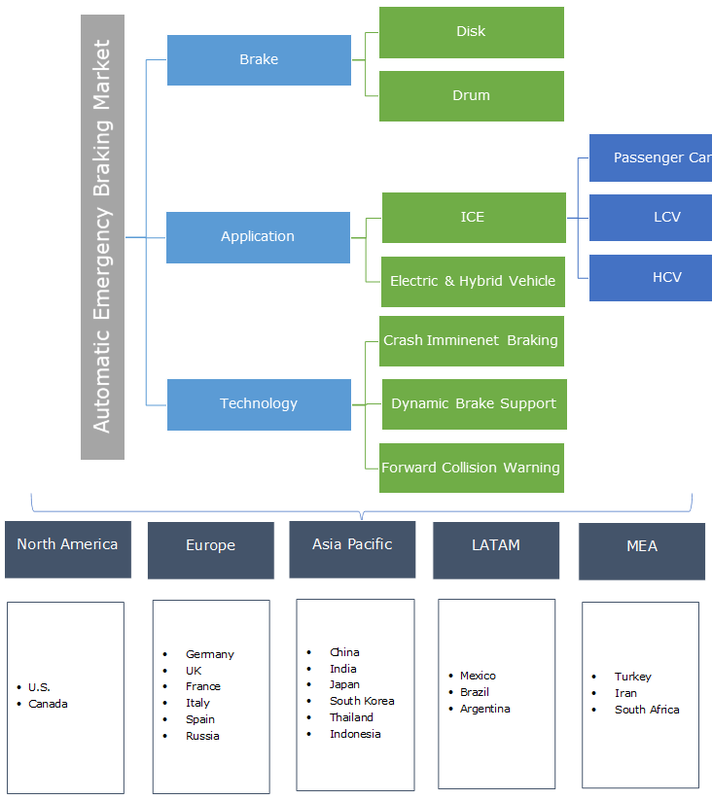 The major players operating in the automatic emergency braking market place include Autoliv Inc., Continental AG, Delphi Technologies, Robert Bosch GmbH, Mercedes Benz, AB Volvo, Volkswagen AG, Siemens, Mitsubishi Corporation, BMW, Ford Motor Company, and General Motors. Other notable players include Mazda Motor Corporation, Honda Motor Company, Groupe PSA, Hyundai Motor Corporation, Toyota Motor Corporation, Magna International Inc., Mobileye, ZF TRW Automotive Inc, Tesla, and Audi. Industry participants are engaged in joint ventures and partnerships with automobile OEMs for innovating their products and increase their market share. For instance, in June 2018, ZF announced a collaboration with Mobileye for the launch of the S-Cam4 range of cameras. This technology enables improved safety and facilitates improved autonomous driving technologies, augmenting the automatic emergency braking market share till 2024. Automatic emergency braking systems utilizes advanced radar and camera sensors for detecting any object in the front of the vehicle. The system automatically applies brakes and alerts the driver in case of any potential risk of accident. The stringent regulation across the globe focusing on improved vehicle safety and standardization of such systems is playing a major role in expanding the market share till 2024. Industry participants are developing technologies including sensor fusion technology and incorporation of stereo vision camera sensors that enhances the overall vehicle safety. The improved detection of objects including cyclists and pedestrians on roads along with the incorporation of advanced software and hardware tools for easier operation and driver alert services further supports the automatic emergency braking market expansion.